So, you know you’re a wine cork craft addict when you send your husband to the store for wine and tell him to only buy wine bottles that have real corks. Priorities… we have them! I mean not only do I love to craft with wine corks, but I am all about coming up with great excuses to enjoy a glass of wine. And what better excuse than making crafts from the wine corks? 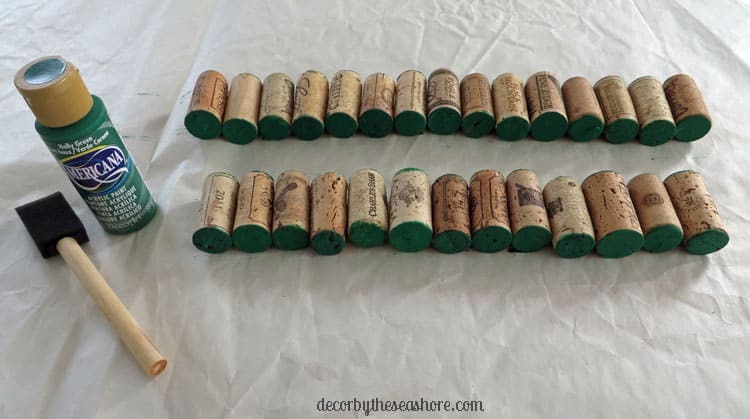 My love for wine cork crafts began with my wine cork pumpkin, and once I saw how wonderfully that turned out, I started to wonder what else I could make from wine corks. And as it turns out, you can pretty much make anything and everything out of wine corks! 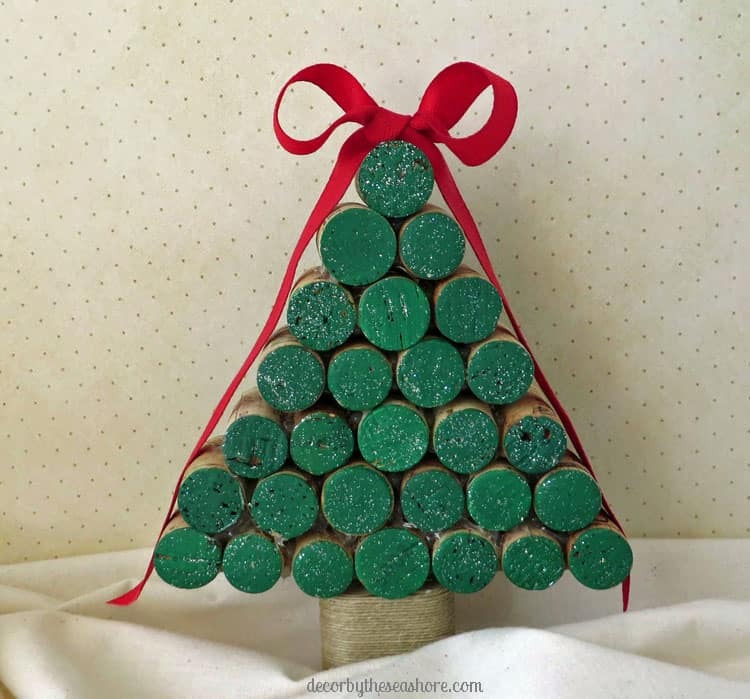 I knew that once Christmas rolled around, I absolutely NEEDED to make a wine cork Christmas tree! 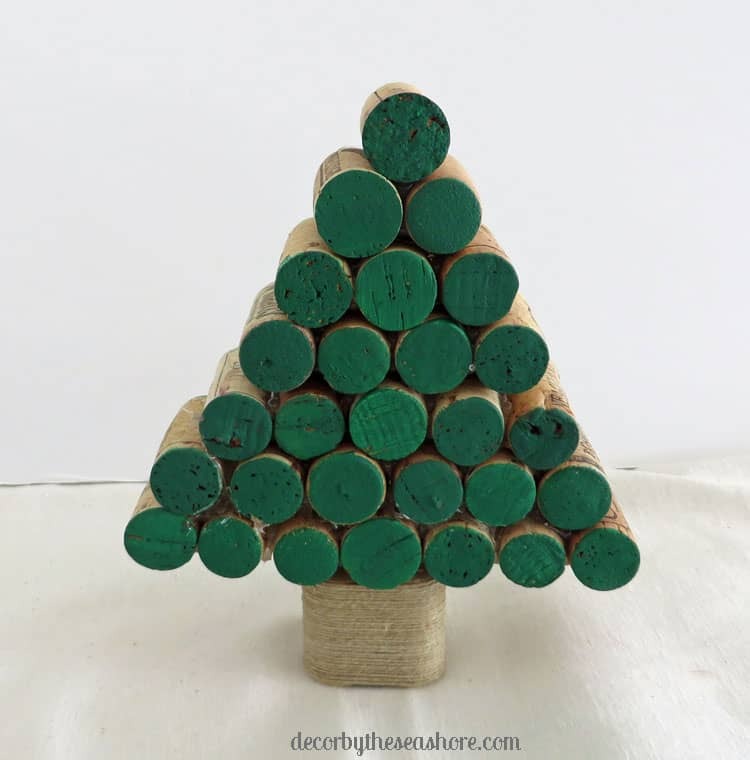 Like my Christmas decor would not be complete without it, and we might even need to (dare I say) postpone Christmas if we didn’t have that wine cork tree! 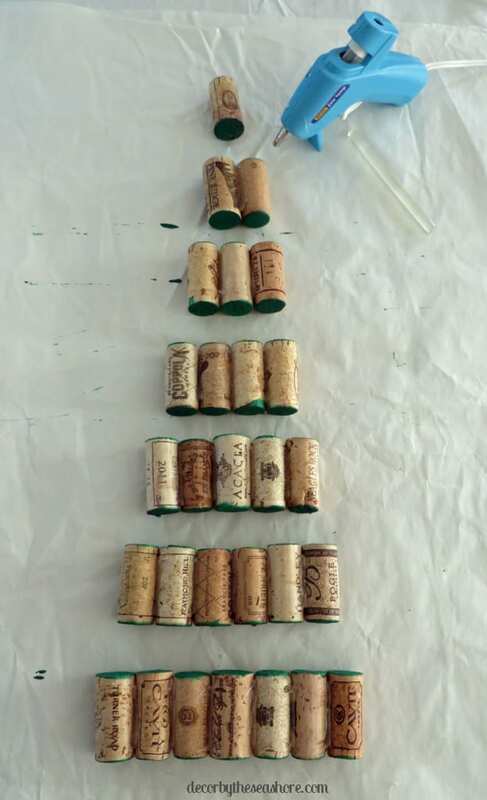 Luckily, wine cork crafts are pretty quick and easy, so I finished my wine cork Christmas tree with plenty of time to spare, and now there is no need to postpone Christmas. Phew! Wine corks make great crafting materials because they’re usually quite abundant (unless you have a wine cork craft addiction like me, in which case you go through them faster than a runaway train). But luckily, I have a secret source for wine corks when my own stash runs low. Did you know that you can buy wine corks for much cheaper than the craft store? (I mean really, what can’t you buy on Amazon is the question?) 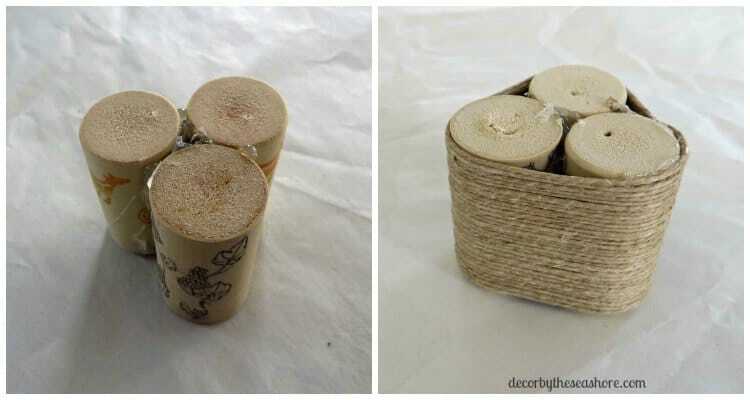 Now you never have to worry about running out of wine corks for all those fantastic wine cork crafts! Craft on, my friends! 1. Set three wine corks aside, and paint the rest of the wine corks green. Let the wine corks dry, and then add a layer of glitter paint on top. 2. While the painted wine corks are drying, take the three wine corks you set aside and glue them together into a triangle. 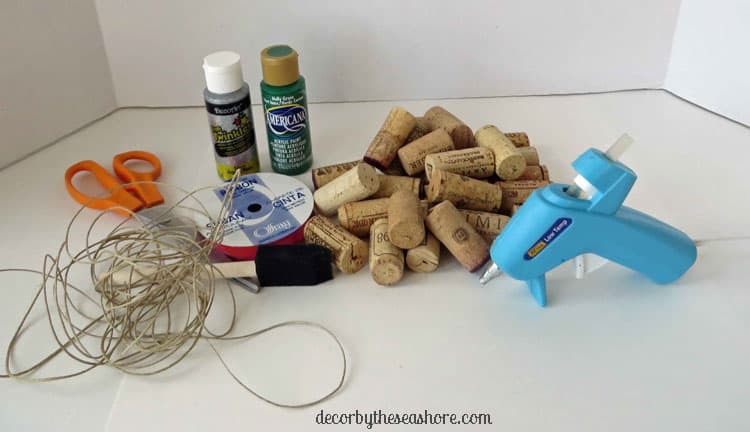 Then glue one end of your twine to the edge of the wine cork triangle and wrap the twine around the corks. Secure the end with glue. 3. Divide your green wine corks into rows. Your bottom row should have seven corks, and each row after that should have one less cork. Glue each row together. 4. Once the rows of wine corks have dried, stack them up and glue them together one row at a time. When all the green corks are glued together into a tree top, glue the twine-wrapped trunk to the bottom. Make sure the trunk is centered so the tree can stand on its own. 5. Now it’s time to add your tree topper! You can make a bow from ribbon and glue it to the top of the tree, or use whatever tree topper your heart desires! 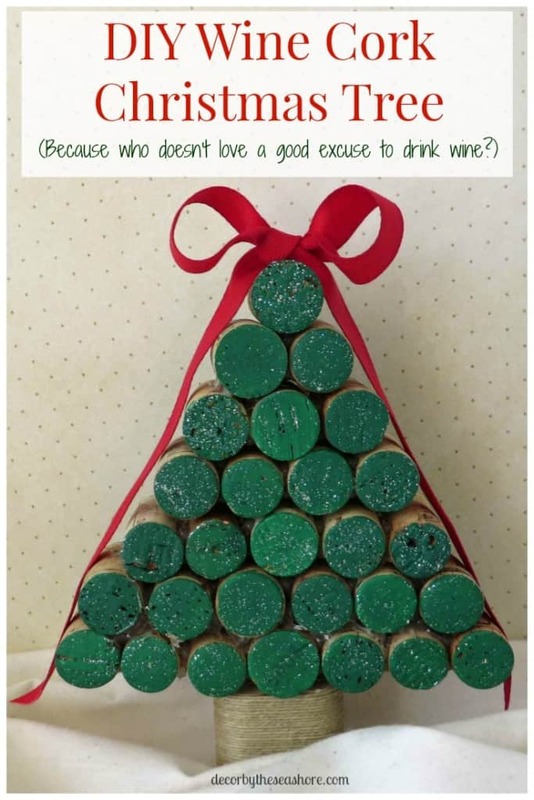 Now you have your very own DIY wine cork Christmas tree to display in your home! Isn’t she beautifully sparkly? I must admit, I forgot about the glitter paint until the very end of making my tree, shame on me! So that’s why you don’t see the sparkles in the photos until the end! 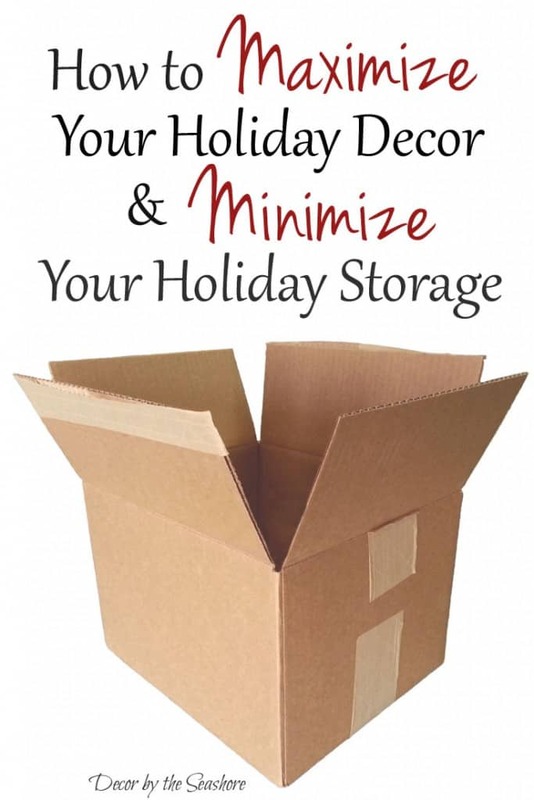 This is really a very easy way to add some beautiful Christmas decor to your home! When you’re done with your tree, feel free to share a picture of it on my Facebook wall to help inspire other crafters! I know I’m not the only one with a wine cork craft addiction! If you enjoyed this post, you’ll love my newsletter. Sign up below for weekly craft, DIY, and home projects and tips! Too cute! This would be fun for my boys to help make! Thanks, Kelly! This is a very easy craft that you could definitely do with your boys! Celest this is so cute! You must have consumed a lot of bottles of wine for that one! 😉 And that goodness we didn’t have to postpone Christmas. I really like how y ou pulled the base together. Great crafting! Thanks, Mary! It was a lot of work to get all those corks, but someone’s gotta do it. 😉 Lol I actually did have to get some from Amazon since my stash was running low after the wine cork pumpkin. It was worth it though! I was worried about it being top heavy, but the base worked out well and it has no problems standing on its own! My friend will love this craft. I am going to pass it on to her. I don’t drink wine, which means no corks for my crafting time. 🙁 I wish I could make it though. Ps I stopped by via the Anti-procrastination link party. I am glad I did. I will follow you via pinterest! Janelle, thanks for passing this along! I’m sure your friend will love it! And if you want to make one yourself, you can always ask friends and family to save their corks for you. Or you can also buy them from the store. I found Amazon has pretty good deals. I will check out your Pinterest as well! Thanks for stopping by! Hi Celeste and thanks so much for leaving me a sweet comment on my Deer Head Bead Board. I tried to reply directly to your comment but you came up as a non reply blogger, so I tracked you down here. Will follow you through Bloglovin! Christine, thanks so much for finding me! I really loved your bead board deer head! I’ll be following you as well! Definitely a neat idea! So cute! So fun.. and I agree, any craft that involves polishing off bottles of wine, is okay in my book! Thanks for sharing at You’re Gonna Love It. I’m sharing this project on Pinterest! What a cute idea! I have a bunch of corks laying around that I wasn’t sure what to do with. Now I know! Thanks for the idea. Glad you liked this, Nikki! This is a great way to use up some of those wine corks! This is awesome! I look forward to trying it out, thanks! Thanks, Abby! Glad you enjoyed it! Omg this is so cute! I can’t wait to make one. Thanks, Kim! 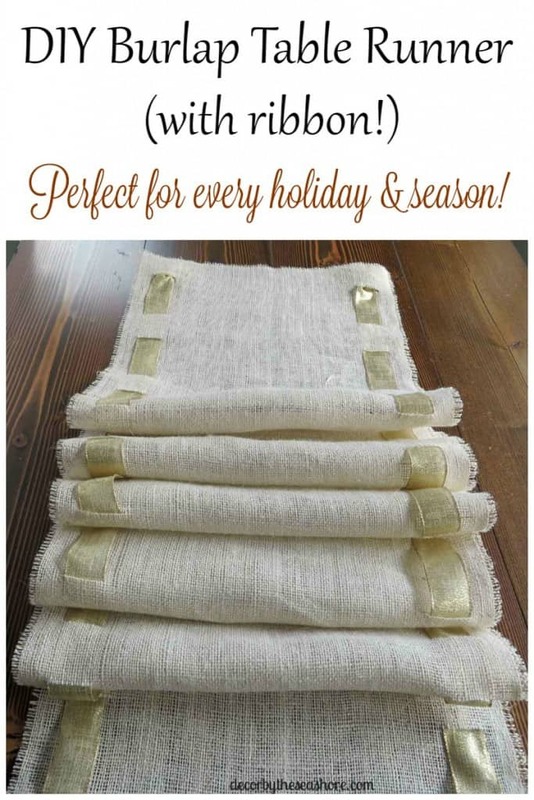 It is really easy and doesn’t take much time to make at all! I definitely love an excuse to drink wine and I love this cute little project. Thanks for sharing at Share the Wealth Sunday! An excuse to drink wine in the name of crafting is the best! I love seeing what other bloggers are up to at link parties! If not for this year, maybe next. Gotta collect those corks 😉 Thanks for sharing at the party. Pinned & shared. Yes, wine corks are one of my most important crafting staples! Thanks for sharing! Thanks, Teresa! You can also ask friends and family members to save their corks for you so that you have enough. I will be sure to check out your link party! Such a cute way to use the wine corks! Your Christmas tree is darling! Thank you! 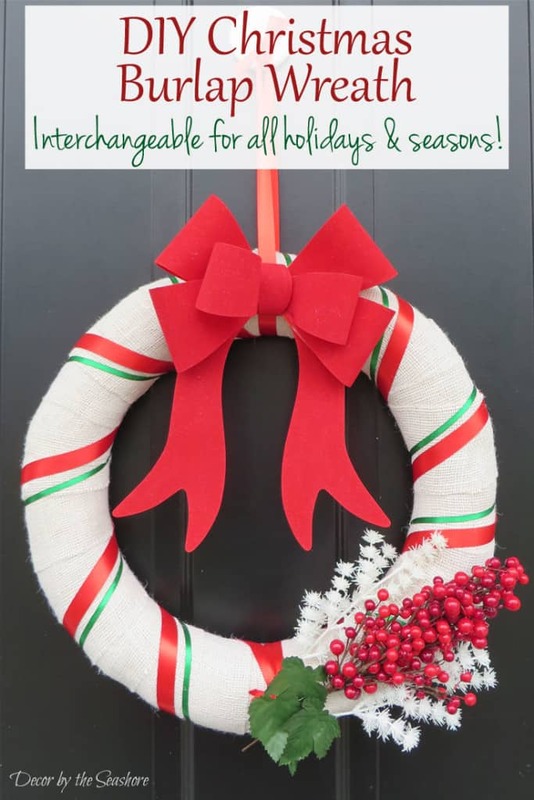 I always enjoy coming up with fun ways to use materials found around the house! A Genuis idea, so simple and very creative, please do join me for #Trash2Treasure, it is a linky for upcycling crafts just like this. Popping over today from Paula’s Linky party. Thanks so much for the feature, Jill! I appreciate it! Have a great weekend! What an adorable idea! I could totally do this! I’ve been looking for new ideas for my stash of wine corks! Thanks for sharing on the Small Victories Sunday Linkup! Thanks, Heather! Hope you’re able to put those wine corks to good use! Happened upon you on Sincerely Paula’s Blog party. Haha Linda, don’t worry, I’ll be adding more wine cork crafts in the future to give you some ideas for all those corks you have stashed away!